Originally one of an ensemble of paintings representing the seven sorrows of the Virgin. 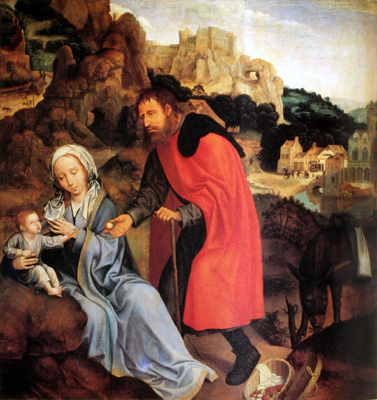 Joseph is at the center handing fruit to baby Jesus dressed as a pilgrim. Mary and Joseph are weeping, sad at the slaughter of children taking place not far behind them, and because the fruit reminds them of the sin of Adam and Eve which will lead to Jesus’ agony and death.